The World Heritage List includes 890 properties forming part of the cultural and natural heritage that the World Heritage Committee considers as having outstanding universal value. This list includes 689 cultural, 176 natural and 25 mixed properties in 148 countries. On this list are 31 properties that the World Heritage Committee feels are in danger. While it may not always be appropriate or even prudent to become involved in some local issues, if you live near any of the properties on the list you can consider how to show subtle support for their maintenance. At the least, visit the properties to see them before they are ruined! This park is located in the Eastern Himalaya foothills, in the Indian state of Assam, and named after the Manas River that flows through the middle of it. The river also forms the border between India and Bhutan. 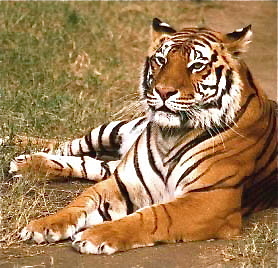 The park was set aside s a wildlife sanctuary in 1928 and later the Manas Tiger reserve was created in 1972. UNESCO declared the site in danger in 1992 due to heavy poaching and terrorist activities. However, the park is slowly recovering due to a small but committed group of people calling themselves the MMES, the Manas Maozigendri Ecotourism Society. Their slogan is ‘Know Manas, Love Manas, Save Manas.’ Not many tourists visit the park even though the visit is well worth making the effort to see the rare and endangered animals living in the sanctuary, including Assam Roofed Turtle, Hispid Hare, Golden Langur and Pygmy Hog, and of course the tigers. Rhinoceros have recently been re-introduced after being poached to extinction. It is also one of the richest bio-diverse areas anywhere in the world, with the sub-Himalayan grasslands continuing up into the dense mountain forest. If you are an expat in Southeast Asia a visit to this sanctuary would bring in valuable revenue and further raise awareness of the support the sanctuary needs in order to continue to protect the rare and endangered species that live here. The Fort and Shalimar Gardens in Lahore are masterpieces of art, design and planning from the time of the Mughal civilization, which reached its height during the reign of the Emperor Shah Jahan. The Lahore Fort is locally referred to as Shahi Qila citadel of the city of Lahore, Pakistan. The fort is at least as old as 1021 C.E. although there has been some type of settlement on this site to at least 1000 BC. The existing fort was built during the reign of Mughal emperor Akbar (1556-1605), and was built upon and improved by following Mughal rulers. Within the fort are 21 monuments, including beautiful marble palaces and mosques decorated with mosaics and gilt. 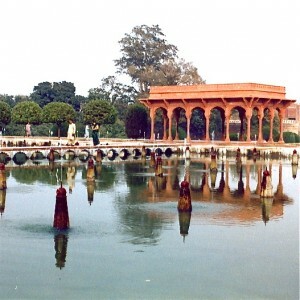 The Shalimar Gardens are located near Baghbanpura 5 kilometers northeast of the main Lahore city. The Shalimar Gardens (‘Abode of Love’) were created by the Emperor Jahangir and his wife, Nur Jahan, in the traditional chahar bagh design, with a central pavilion in a rectangular pool where the canals meet. The gardens were originally approached from the lake by a long canal from Lake Dal. The canal also feeds the over 400 fountains and waterfalls. UNESCO added the gardens to the list of sites in danger because the outer walls and the hydraulic works are in urgent need of repair. The rice fields of the Ifugao have continued high (5000ft) in the mountains for 2,000 years, the skills to maintain them passed down from one generation to the next. The rice fields represent the harmony between man and nature, as well as the ancient Philippine socio-cultural, economic, religious environment that continues today. Few sites in the world today are preserved so well by continual use in their original form. 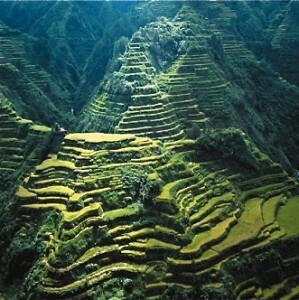 There are many areas of terraced farming in these mountains, but he Ifugao farms are higher and built on steeper slopes, requiring much greater engineering ingenuity. Complex irrigation systems that harvest rainwater from the wet forests at the mountain tops as well as an elaborate farming system that incorporates lunar cycles, zoning, soil conservation and an amazing pest control system using herbs also make these rice fields historically important. In 2001 these rice fields were listed as a site in danger by UNESCO because of deforestation of the mountain forests. Sadly, many younger generation are now leaving the area in search of work elsewhere or in local tourist trade rather than in the rice fields, which further puts these farms in danger of being lost.